After a lengthy and troubled journey, it is finally here: Gutenberg - The new editor of WordPress 5.0, a replacement for the previous Tiny-MCE editor. In this article, you will get 12 helpful tips that will increase your productivity with the new Gutenberg enormously. To get started, you must first find out where your tools are in the Gutenberg Editor. For your convenience, I have created the following graphic. You need this button to add new blocks in Gutenberg. At the same time, you can see all available blocks at a glance. But there is an even faster way to insert blocks. This is the main area of the editor. At the top, you will find the title of the page or article and below that the content. As you can see, you can perform many of the same actions here as in the main area. There is only one important difference: If you select a block here, the system changes directly and you can start editing immediately. Let us come to the illustration of point 3. If you click on one of the paragraph blocks, the system switches to the Block tab and you get the functions for changing colors, text size (point 4), dropdown menu, etc. If you want to return to a different setting, you can simply click your way out of the block or select the Document tab. The new content blocks and choices are one of the great advantages of Gutenberg. Those would have never been possible before with the native TinyMCE editor. It may well be that some of your favorite plugins have also created their own blocks. So it's worth looking into it. For example, if you have a gallery plugin, it might well be that it also has a special gallery block for you. Let's go a little deeper now. The +symbols are good for browsing the available blocks but slow down the way to add new blocks. To bypass all the mouse clicks that would be required for an entire post, just type "/" and you will get a new block and name it. What's nicer than shortcuts? Anyone who likes to work productively will surely agree with me. Most general key combinations also work in Gutenberg. 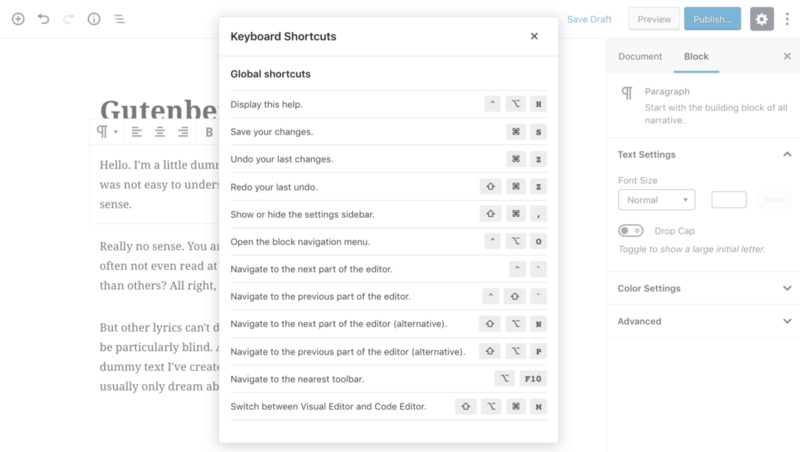 In addition, Gutenberg also offers a special swing of special shortcuts that you can use to save time. Ctrl + Alt + Backspace - Delete the selected block (Super helpful, otherwise you would have to click multiple times to delete a block). Ctrl + Alt + T - A new block is inserted before the selected block. Ctrl + Alt + Y - A new block is inserted after the selected block. Ctrl + A + A - The entire content is highlighted. * Create an unordered list. For example, if you want to create an H2, type "##" and then press the space bar. Now Gutenberg automatically creates the heading block. To save time, you can also subsequently convert a block to another block type instead of inserting a block for each content type. Other block types can also be converted, e.g. the conversion of a title image into a normal image. Some people don't appreciate how the Gutenberg toolbar fades in and out when you switch between blocks. 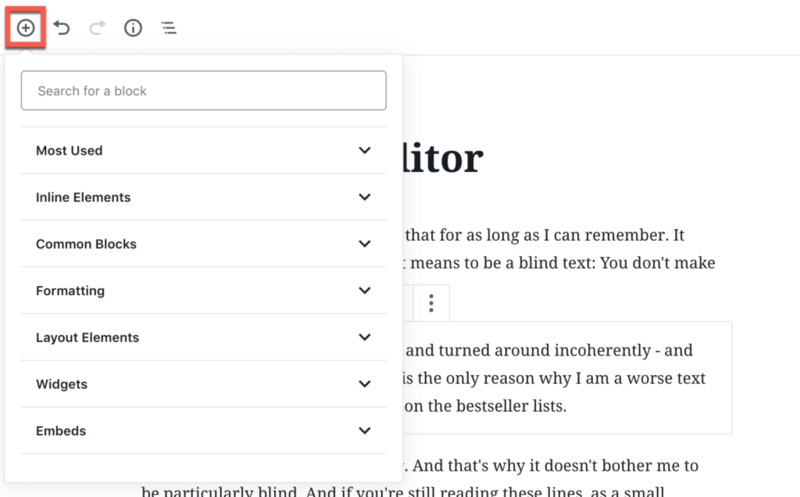 If you also don't like it, you can activate a fixed toolbar in Gutenberg, which can be used at any time at the top of the Editor. You can activate this mode by clicking on the three points in the upper right corner and selecting Upper Toolbar. We all still know the "cut and paste" function to rearrange our content. This function is still available. A more convenient way, however, is to use Gutenberg's integrated drag-and-drop layout controls. In order to move your blocks to a new position using the Drang-and-Drop function, you must first activate this mode. Move your mouse over the block and then over the six-point symbol on the left. You can also use the up and down arrow keys to move blocks in that direction. 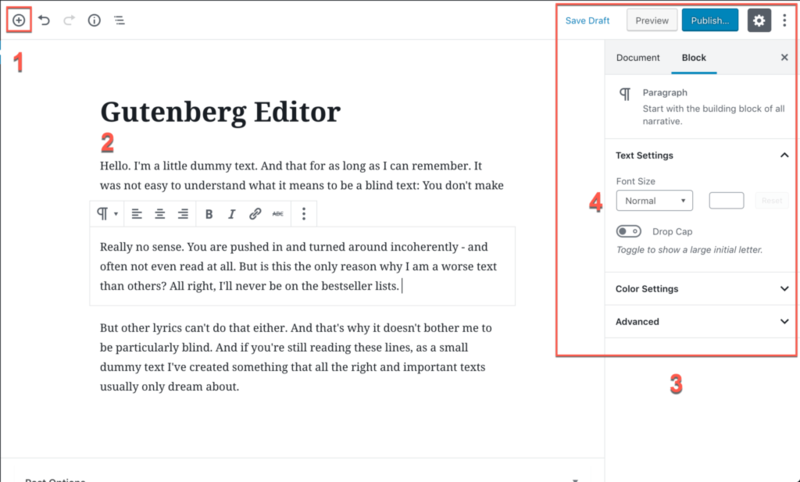 In addition to the new content blocks, Gutenberg also offers you the opportunity to become more creative within the Columns. Once you have added a column, you can add more blocks within it. It is also possible to nest the columns further to create more distance. To create this, I simply added another block inside the left column of the existing Columns block. Here, too, we have received a very cool Gutenberg function to save time. Once you have created a specific block configuration that you will need to reuse in the future, Gutenberg allows you to save any set of assembled blocks as a reusable block template. This will save you a lot of time because you won't have to reassemble everything every time. To do this, first select all the blocks concerned by simply clicking and dragging as before. Now you have created your block template and can give it a name. From now on you can simply insert this entire block template, as with any other Gutenberg block. It's also great that you can import/export block templates as JSON files to use on other pages. Click on the three-point symbol in the upper right corner to access your blocks. Since the Gutenberg sidebar is very similar to the WordPress editor, backend contribution editing is quite simple. With the current TinyMCE editor, you're probably used to jumping to the Text tab for direct HTML editing. Gutenberg still lets you do that, you just have to click your way through the block tags.